Address: Located between Soutwark Bridge and Blackfriars Railway Bridge. The pedestrian bridge linking Bankside with the City of London. The northern bankseat is located at St. Paul's Cathedral and the southern bankseat is located at the Tate Modern Gallery. Sure it's just a bridge! but you get a little cool views of the city from a little special angle. 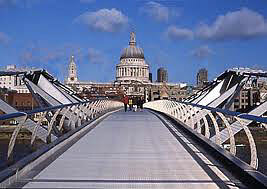 So why not walk across the famous pedestrian bridge Millennium Bridge. 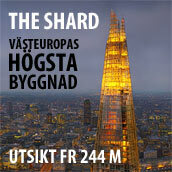 It is 325 meters long and was opened in summer 2000. Financial Times held an international competition in 1996 together with the London Borough of South Work on designing a foobridge that would go over the Thames between Soutwark and Blackfriars bridges. The bridge would open at the new Millenium shift in 2000. Winners of the contest became Foster and Partners / Sir Anthony Caro / Ove Aru & Partners. Construction started in Feb 1999, and June 10, 2000 the Bridge opened. Please visit from Tate Modern side to the other side towards St Paul's Cathedral. The view towards the church is cool! Strolling happily over in the evening, the lights are nice both across town and cathedral.